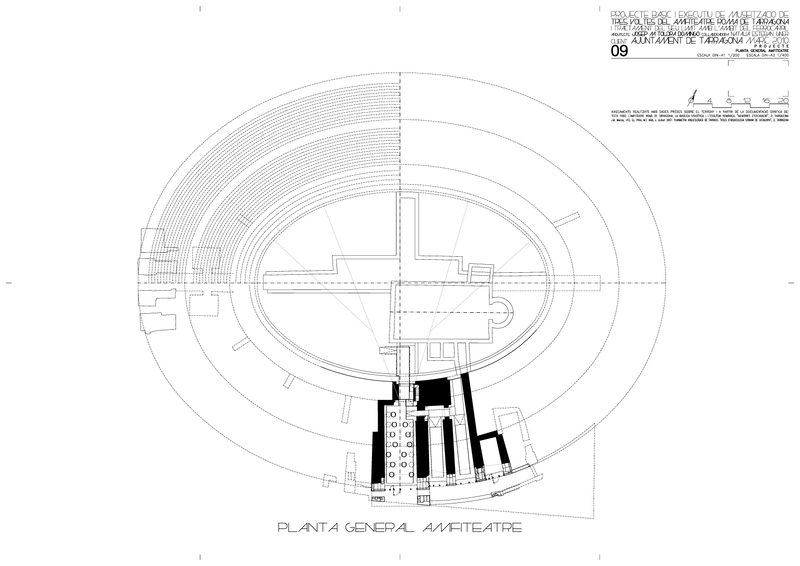 The starting point of the project was the need to provide the monumental complex of the Amphitheatre of an interior space to house a museographic installation. Tarragona City Council chose to allocate for this purpose three vaults on the lower level of the structure that supports the southern tier of the Amphitheater, the only covered space available big enough. Currently, it cannot be visited, it is not paved and its only function is to store inventoried items during an archaeological campaign carried out in the 80’s. 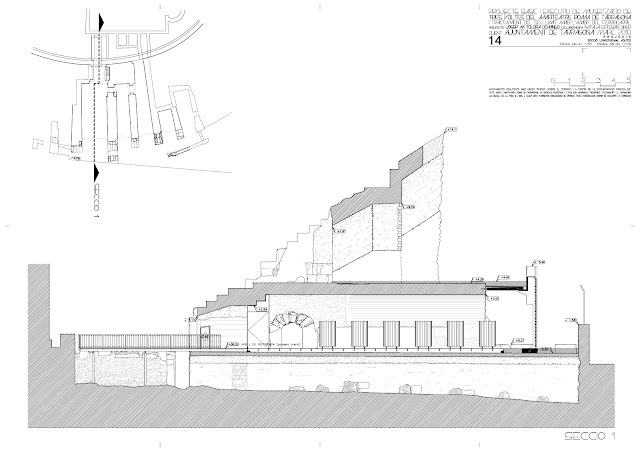 We propose to close the southern facade of the tier (the one that looks to the sea) along the original outer boundary of the Amphitheatre, alternating opaque brick walls in the sections facing to the supporting walls with steel lattices in sections that correspond to the vaults. 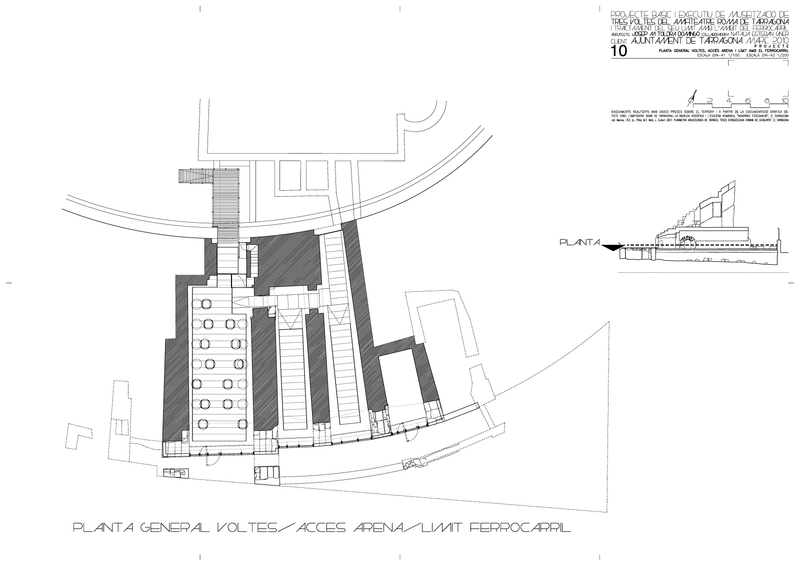 A plane is formalized, slightly detached from the existing structure, generating a 2 meters wide strip covered with a concrete slab, but slightly separated from the envelope forming a indirect light entry. Two generously sized doors are integrated into the steel lattices. 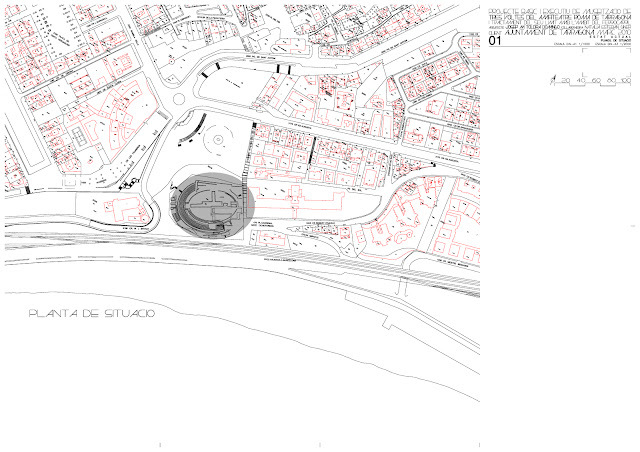 Currently the southern façade of the tier is separated from the waterfront by the presence of the railway, but a future removal of the rails can allow a direct access from the Miracle beach to the Amphitheatre. The main vault communicates with the Amphitheatre’s arena through a change of section in which it becomes narrower, leading to an existing walkway that covers a section of the arena’s fossae. 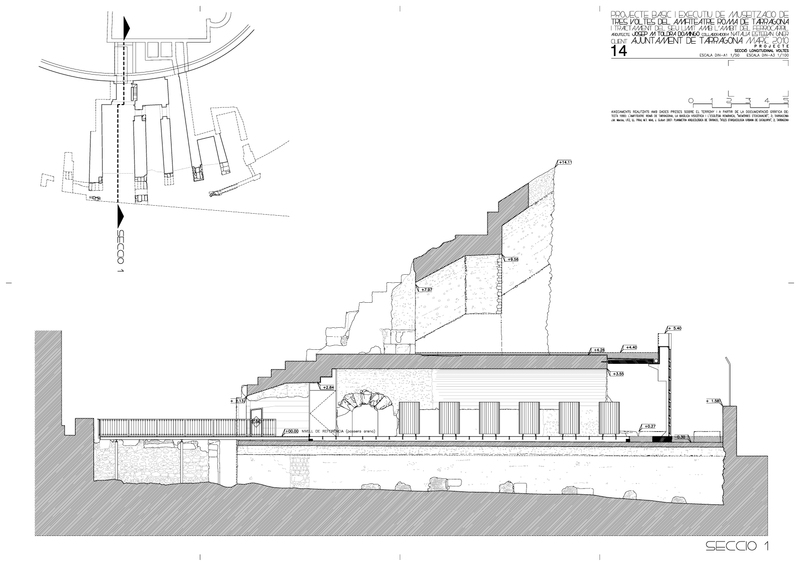 The project proposes to make accessible the walkway via a ramp, and prolong it inwards generating a small covered outdoor space that reaches a glass enclosure. The access door has its longitudinal axis aligned with the vault (and perpendicular to the enclosure glass) to minimize the visual impact. Interior treatment of the vaults is limited to the plane of the pavement, built by platforms separated from the perimeter of the spaces. Electrical installations are arranged under the anti-slip glass new flooring. 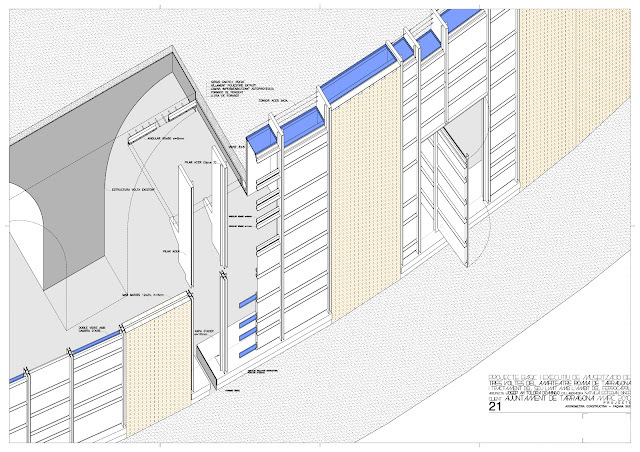 The main vault, thanks to its generous dimensions, is useful both for the display of museographic material as well as to host events. It will be provided with mobile exhibition panels, which will allow to configure the space as needed, for example, releasing the central space if a conference is scheduled. In the two secondary vaults there will be educational elements on exhibition (panels, fragments of building materials, audiovisuals, etc.). The vault furthest from the main one has also an open window to the amphitheater’s arena, just in a particularly interesting area to observe the graves uncovered by archaeological excavations.